To get to Motion Charts, just click "Visualize" at the top of any report that has a table with two or more values. Reports from which you can launch Motion Charts include New vs. Returning Visitors, Languages, Referring Sites, Keywords, Top Content and many, many others. A standard graph shows data across two dimensions, (X-axis and Y-axis). On the other hand, Motion Charts let you look at data across up to five dimensions (X-axis, Y-axis, Color, Size and Time). If you're having flashbacks to high school math class, don't panic! Let's look at an example. We'll use Motion Charts to spot a trend of increasing visits from users of Internet Explorer on the Windows operating system. Start by navigating to the Browser and OS Report. Next, click the "Visualize" button at the top of the report. After clicking play, the chart begins to change. Midway through the period, the "Internet Explorer / Windows" bubble has moved and now hovers near the middle of the chart. The other bubbles stay to the left, showing that the increase is not a trend across all the browser/OS combinations. By the last days of the period being charted, the Internet Explorer / Windows bubble has moved to hover in the far right corner, representing a substantial increase in both Visits and % New Visits. Thanks to the Motion Chart, this trend was easy to spot. Here's the real question though, what do you do with an observation like this? The project manager may budget additional time for quality testing in Internet Explorer vs other browsers due to the change. The marketing manager may use the insight to refine his or her understanding of the audience for the site, adjusting the sales copy to match known preferences of Windows users. The advertising manager may conclude that the company's new Mac-focused campaign was actually reaching the wrong audience and adjust accordingly. Focus on those bubbles that move more gradually. Often these are the bubbles based on the largest amount of data and are less likely to be thrown off by random, one-time occurrences. Use the trails feature to visualize a bubble's path across time steps. You can turn on trails by hitting the "Trails" checkbox shown below. Change your timescale from days to weeks when looking for longer-term trends. To change the time-scale on your motion chart, navigate back to the report you want to visualize, select the middle button next to the “Graph by” label on the upper-right hand corner of the graph and then click "Visualize" to return to the motion chart. Focus on trends that let you take action. If you're easily able to make adjustments to your advertising mix but not your sales copy, then you may want to start your analysis by looking at keyword trends and campaign performance rather than landing page optimization. What do you use motion charts for? Have you ever used motion charts to spot a keyword or site usage trend? Add a comment and tell us about it! 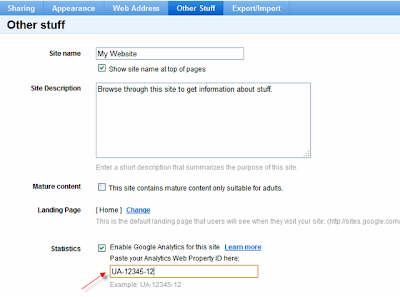 Posted by Jessica Hullman of PureVisibility, a Google Analytics Authorized Consultant. Motion Charts make it possible for you to perform both high-level analysis (such as identifing long-term trends) and targeted analysis (aimed at gauging the impact of a specific change or event). : Delivered from an analyst's perspective, Day 1 will focus on what reports to look at and why. You'll also find out about performance indicators that can alert you of potential problems. Day 1 also covers the latest Google Analytics tools: Advanced Segmentation, Custom Reports and Motion Charts. Day 2 - Technical Insights: Day 2 will cover how to properly set up Google Analytics from a technical standpoint. From filters to code customization, all the technical topics you need are covered on Day 2. Day 1 - Business Insights: Delivered from an analyst's perspective, Day 1 will focus on what reports to look at and why. You'll also find out about performance indicators that can alert you of potential problems. Day 1 also covers the latest Google Analytics tools: Advanced Segmentation, Custom Reports and Motion Charts. You'll need to have mastered all 9 of the below to call yourself Emperor. If you're doing less than 3, you're still a Newbie. 8. Internal site search baby! Rock it! Want to hear more on the above? Check out Avinash's post on Deeper Analysis & Insights for the full story. Worth a good weekend read and could be your ticket to Analytics Emperordom! What kind of analytics user are you? Our Analytics Evangelist, Avinash Kaushik, has created a "Nine-Point Checklist of Analytics Awesomeness" to help you find out. Are you an Emperor or a Newbie? As a best practice, we're including the try and catch in the snippet and updating our help materials to reflect this change. If you've added a profile recently to your account or read a help article that discusses the tracking code, you may have noticed an addition to the tracking code snippet. You do not need to change the tracking code in your existing pages, although doing so will add a layer of functionality that I'll explain in a minute. Here is the updated snippet, with the additions in bold. The introduction and user training course is designed to provide a high-level overview of the products and will cover key features and reports. It's perfect for a marketer or account manager who is interested in learning more about how Google Analytics works, and who wants to understand how to use the information in reports to make decisions. The advanced and technical implementation course is for those who need hands-on implementation training. This is a great class for those of you who need to install and set up Google Analytics on sites. You'll learn about and discuss different ways to set up Google Analytics to get the types of information that you need. Learn how to make landing page testing work for you. You will hear from the experts on using Google Website Optimizer and testing the pages of your website to find out what works best for your visitors. Best practices will be covered, and you will leave with real hands-on experience running A/B/N and multivariate tests using Google Website Optimizer! What happens in Vegas.. doesn't have to stay in Vegas. At least not when you're going there to attend the Google Analytics and Website Optimizer Seminars for Success! Spend one to three days learning about Google Analytics and Google Website Optimizer. Come back armed with best practices and tips from the experts on how to use them to improve your business. These courses are ideal for marketers, web designers, web analysts and anyone who wants to improve their online business savvy. , we gave you a few tips on using Website Optimizer and Google Analytics to improve your business online. As a follow-up, we announced the Website Workout contest last June. Four businesses were selected to improve their conversion rates using the data they gained from Website Optimizer. The results are in! Find out how the winners improved their conversion rates here. I think you'll be surprised how a small change can make a big difference. For more information on how to optimize your site, check out the Website Optimizer Blog. Last April, we gave you a few tips on using Website Optimizer and Google Analytics to improve your business online. As a follow-up, we announced the Website Workout contest last June. Four businesses were selected to improve their conversion rates using the data they gained from Website Optimizer. A metric is a quantitative measure of how visitors interact with your site. Metrics include things like pageviews (the number of times visitors viewed a page), time on page (the amount of time they spent looking at a page), and bounce rate (the percent of visitors that leave your site after only 1 page). The important thing to remember here is that metrics are always numerical. Metrics will be your column headings, horizontally across the top of your report. A dimension is a characteristic of a visitor or a page on your website that you can use to organize your metrics. Dimensions are almost always text, such as "new" vs "returning" (visitor type) or "North America" vs "Europe" (region). Dimensions will make up the rows in your report and will let you drill-down to multiple levels of detail (e.g. you can click on "Google" to learn more about that referring site). 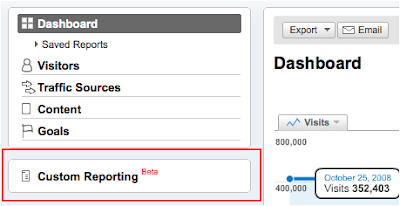 1) Navigate to the custom report page. We put together this video to give you step by step instructions on how to create your first custom report. For more detailed instructions on how to build a report, visit the help center. Custom reports are most useful when you have to combine metrics and dimensions that are not combined in other standard reports, or when you want to simplify an existing report by removing data that's not relevant. Here are some of the things that custom reports let you do. COMBINE METRICS FROM MULTIPLE REPORTS - Custom Reports let you group together whichever metrics and dimensions you find most relevant. This lets you go beyond standard reports to compare data from multiple areas of GA all in one place. This means less switching from one report to another and more flexibility in how you analyze your data. Example: An outdoor sporting goods store places a heavy emphasis on paid search to drive e-commerce transactions, and uses the AdWords Campaigns report often. When it comes time to share reports among their internal teams, they currently do multiple exports in order to incorporate metrics from the Site Usage, E-Commerce and Clicks tabs all in one view. With custom reports, however, they can drag and drop the metrics they'd like to see from each tab and perform a single export into Excel in order to share their data with team members. CREATE RELEVANT DRILLDOWNS - By making use of multiple sub-dimensions in custom reports, you can create a report that drills down up to five levels deep, in whatever order you choose. This lets you easily break visitor behavior into workable segments, with more precision than ever. The agency managing the placement and measurement of these recruitment ads needs to report back to Cross Country's management team on their performance, but when they navigate to the "Campaigns" report, they can only drill down one level (done by choosing a value in the "dimension" dropdown). But wait! By using custom reports, the agency can now arrange drilldowns up to five levels deep, in whatever order they choose. This now makes it easy to show Cross Country how their Spanish-language print ads in Los Angeles did vs their Spanish-language banner ads in Chicago and optimize their spend accordingly. SIMPLIFY REPORTS TO SHARE WITH COLLEAGUES - If you need to share data with teammates that may not work closely with Google Analytics, you can use the tab feature in custom reports to create specific tabs for individual people or job functions. This lets your colleagues see only the data relevant to their activities and helps cut down on confusion and data-overload. Example: National Pizza has a wide range of online marketing campaigns that it uses Google Analytics to track and monitor. Several people within the organization regularly log in to Google Analytics in order to check on the performance of different campaigns. Now the webmaster can create a custom report with one tab for each of her colleagues. Each colleague gets a custom view with only the data relevant to his or her activities. Which metrics can I put in my report? You can choose any metric to build your custom report with. You also don't have to pair them with dimensions, which means there are no restrictions to which metrics you can use. However, when they are paired with dimensions, metrics are subject to certain restrictions. Please see this chart to understand which metric and dimension pairings are possible when designing a custom report. What do you use custom reports for? Send us an email and let us know! Be sure to send some screenshots. Happy reporting! We've been taking an in-depth look at some of the new enterprise-class features that were recently launched in Google Analytics, and we're proud to present the next installment. This one relates to Custom Reports. Custom Reports are like super reports. You can spend literally five minutes building one and feel like you've just built your own metrics dashboard. Building a tailored report is easy and it feels great! It means quicker access to the information you care about, less data overload, and easy sharing with colleagues. Let's dig into some of the details. a Google Analytics Authorized Consulting company out of Idaho. Here is the rap. I promised him glory since we're all out of T-shirts. Hope to see more like this next year! 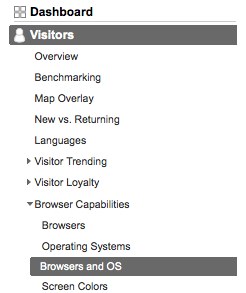 2008 was an amazing year for the Google Analytics Authorized Consultants (GAACs). These guys are experts with Google Analytics, providing excellent service in areas such as installation, consultation and training. They're located all across the US, which means you can probably find one near you. We really like hearing from GAACs because they eat, live and breathe GA every day. Once a year, we invite them to Google for an event called the Google Analytics and Website Optimizer Authorized Consultant Summit (GAAWOACS for short... just kidding). This past December over 200 participants from more than 30 countries attended. Vint Cerf keynoted and we had four days full of product information on Google Analytics, Website Optimizer and Urchin delivered by our Product Management team, plus case studies, networking and oh yeah.. lots of food and drinks. We're not sure who looks forward to it more, the Authorized Consultants or us, but it's clear something's going right when a participant produces a rap about the event! Cheers to Paul Chastain from Just1 a Google Analytics Authorized Consulting company out of Idaho.